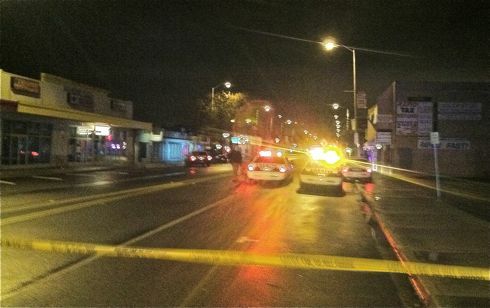 12:21 AM: According to scanner information, there’s been a shooting in the 9800 block of 16th SW in White Center, one person described as having been shot in the head. 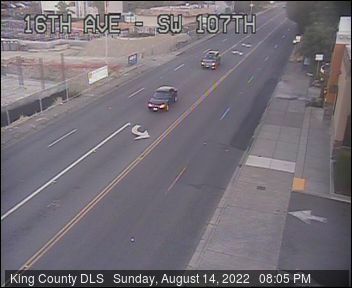 The King County Sheriff’s Office is asking for Seattle Police help in the search for a man in a black mask armed with a 9 millimeter gun, last seen headed north on 16th SW (toward West Seattle). That’s all we know so far. 12:40 AM: We have a crew headed to the scene, and Sheriff’s Office spokesperson Sgt. Cindi West has announced via Twitter that she is going there too. 1:49 AM: KCSO Sgt. West confirms that the victim, a man in his 20s, was killed. 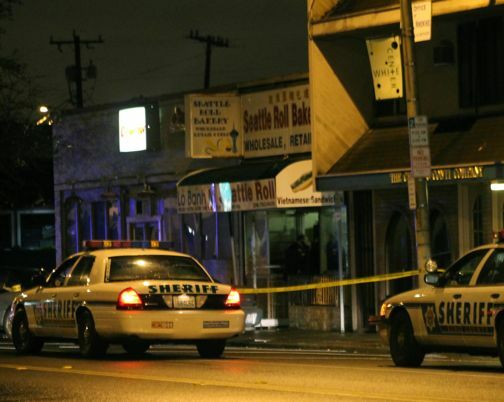 The shooting apparently happened during the robbery of an open-all-night business she described as a sandwich shop (listings for the address, 9828 16th SW, are for Seattle Roll Bakery, known for its banh mi sandwiches), and she says the victim was one of at least three employees in the shop at the time. 5:05 AM: TV stations are live in downtown WC for their morning newscasts. So far, no new information beyond what we had reported as of three hours ago. Sgt. West promised an update later this morning when she gets new information from detectives, who are still on the scene right now. NOON: No new official information from KCSO; Sgt. West sent an update basically saying she’s still working with detectives to see what can be made public. Cops are searching all over the Highland Park neighborhood for that guy. I hope they find him. This kind of violence (or any violence for that matter) needs to stop. Please keep us updated when you can. Thanks. I have put a note on WSB as well in case anyone is going there to look for info on the search. My co-publisher should be at the scene momentarily and we’ll have more info as soon as it’s available. I have always loved to shop on White Center. It’s ethnic charm is so sweet. Small businesses that stay together even in these tough times. Its so sad that lately I don’t want to go there when it’s even CLOSE to getting dark in the evening. I plan to support the area now more than ever. SAD SAD SAD. Thanks for the reporting. We were wondering about all the sirens last night. So sad about the violence behind this. There are so many things going on! Like at the mall, walmart, and now this. oh my.